The ‘015 patent attempts to fix a common problem experienced by most gamers. In past games when the camera is placed directly behind a character, the player had a hard time seeing friends or enemy players unless they were in front of the character. The current invention describes a method that allows a player to spot other players or enemies with greater ease. The system gives weight to each character in a game and then attempts to balance out the weights so that all characters can be shown on the screen. The user-controlled character is given the most weight and the camera will attempt to place him in the center of the screen when possible. Friendly characters (controlled by other users) are given the second most weight and the camera angle will attempt to fit them into the screen at all times as well. Lastly, enemy (computer-controlled) characters are given the least amount of weight and the camera will place them in the view if possible, but will not drastically change the angle to accommodate them. Under this invention the camera should make playing with friends easier and should help make them game more enjoyable. In accordance with a level of importance of a character, a weight is provided for the character. 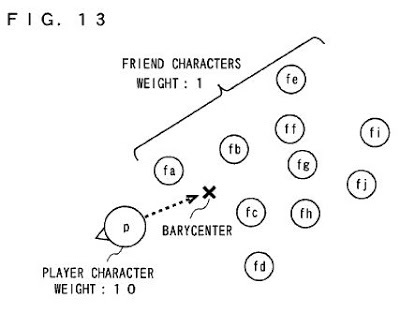 For example, a character operated by a player is provided with a weight heavier than those provided for other characters, and other characters are provided with the respective weights lighter than that provided for the character operated by the player. Based on the weights and positions of the characters placed in a predetermined area, a position of a sight point of a virtual camera is determined. Thus, it is possible to generate a display image in which a plurality of characters in a virtual space are placed on a screen in a balanced manner. 1. A storage medium for storing an image generating program which causes a computer to generate a display image used for displaying a plurality of objects placed in a two-dimensional or three-dimensional virtual space, wherein the image generating program causes the computer to perform: storing weighted values of the objects; storing positions of the objects in the virtual space; determining a barycenter of the objects based on the weighted values and the positions of the objects; and generating a display image in which the barycenter lies in approximately a center of the display image, wherein a heaviest weighted value is assigned to a player character which is operable by a player, and wherein a weighted value equal to or greater than a sum of weighted values of objects other than the player character is dynamically assigned to the player character.